Thank you very much Miss Aida and Mama Micki , I appreciate your replies. Dearest Sacred Heart of Jesus ,wonderful Mother Mary and my dearly beloved Father God I thank you all so very much. I love you all so dearly. I'm interessed in the Petro rite, for this I would like prepare the special drunk for these loa called "Kiman". I would be very glad if you could me tell the recipe of kiman or help me further in this subject. I never thought of them giving you clues through any other way. I am about to begin a Altar in my room to have Guardian Angels, Saints, and Ancestors come to me and help me with Rootwork. I have everything prepared. But I just want to know is it even possible to hold a conversation with a spirit? I'm gullible and ignorant to the fact if people shoot me hints or riddles? I suggest that you find a Forum -- or better yet a teacher -- familiar with and able to answer your questions about Haitian Voodoo. How one communicates with Deities, Angels, Spirits, and Saints will vary according to one's religious customs. There is another thread for communication with Ancestors, and you may ask the same question there, but THIS thread is about communication with discarnate spirits who either never incarnated or whom you have never met physically and who are not related to you by DNA or family -- in shorts, gods, goddesses, archangels, angels, nature spirits, animal spirits, and holy ones who have been canonized or otherwise honoured by a religious group of some kind. So, having made that clear, i would have to tell you that we cannot teach you any religious path. We do not know if you are a Muslim, a Jain, a Christian, a Jew, a Taoist, a Hindu, a Buddhist, or a Wiccan. The gods and goddesses of those religions all have customary methods of communication with human beings. Ask your elders in your tradition. However, since you mentioned the Guardian Angel, i can perhaps assume that you are working in a Jewish, Spiritualist, or Christian religious framework. The Guardian Angel is not known for being hyper-verbal, but often shows the way through deeds and actions. One approaches this angel with prayers, asking for assistance and signs that helping hands have been extended. One may speak aloud or pray sub-vocally. 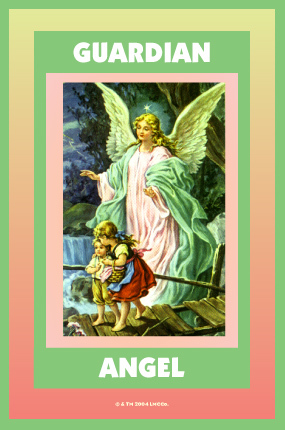 This angel may speak, but is more often perceived as a way-shower and helping guide. This picture shows you the experience that many have with the Guardian Angel -- it shows two little children, completely unconscious of the dangers of the broken bridge that they are traversing, being guided and guarded on their journey by their loving, silent Guardian Angel. When it comes to Saints, again, each one has his or her own traditions. Be aware that the word "SAINTS" has entirely different meanings in the various lineages, traditions, and denominations of Christianity! PLEASE read this web page i have written as part of "Hoodoo in Theory and Practice" about the meaning of the word "SAINTS" in Christianity! If you work with Catholic saints, see your fellow Catholic dedicants for words of wisdom from them. I'm currently hoping to learn more about the practice of "punishing" or "scolding" a St. who has become "lazy" or complacent in their work with you. Meaning you have been consistent with your offerings, prayers, devotions, etc. and for a reason that you can't seem to discern - they no longer pull through for you. Another online resource uses the guide below as a suggestion, but I am hoping to gain insight from LM. If this is the wrong thread and there is another conversation going elsewhere, please feel free to direct me. I did what I considered to be a thorough search for the topic/material and only go piecemeal comments on it. 1. Rebukement. Reprimand the spirit in the name of a higher power, usually Jesus, but if you are working outside a Christian context this may not be workable for you. The idea here to verbally shame the spirit by explaining how you have faithfully prayed to him or and consistently made their offering only to have the spirit ignore your request. 2. Reversal. Turn the spirits image away from you if it is a statue, or upside down if it is a picture. This is an act that is believed to make the spirit uncomfortable and ashamed. When the spirit begins working for you again, set the image back correctly. For an example of this type of punishment we need only to look to Saint Anthony. Saint Anthony is often prayed to in order to find lost objects, however, in Latin countries he is often prayed to by those seeking a husband or wife. When Saint Anthony does not work for the petitioner, he or she will often turn the statue upside down or in some cases take the baby away from him in the belief that he will work faster for the petitioner. 3. Withhold Offerings. Spirits draw strength from the offerings we make to them. When they don't receive their offerings they grow weak and will be more inclined to work with you. So I don't know if this would be the right place, however here goes. I like to buy holy statues not Christian but Buddhas, Greek Gods, ect. I find when i buy Hindu statue, Ganesh for example, who is supposed to be lucky, and road opener, I tend to have really bad luck till the status is out of my house. I believed it was just Ganesh till i bough Hanuman. It was calling to me on Amazon, it arrived and I was so happy. I washed it in ammonia to clean anger from chinese worker who made it, put it high up in my "protection" closet, and suddenly I am sick, I have cold that will not go away, my tax refund is missing, my mail is being lost, you get the point. I have covered the statue with uncrossing powder to stop the run of bad luck. Hanuman is a border God, who stop evil from entering a space. I had no intention of turning Hindu, I just liked the figure. Is it me or is the Hindu Pantheon against me? I personally have not done a lot of work with Saints and so only have limited experiences with them. I have never worked with them in the way you are describing but I have heard of turning pictures upside down to make them uncomfortable. For me saints are very specific entities who are present and able to do things on peoples behalf who have a relationship with them. I feel that for people who are raised within a tradition that includes saints, they will have an easier time approaching them and asking for things as those saints have been introduced to since that person was a small child. In that case perhaps this kind of shaming would be something that could work. For instance I have a good friend whom I have known for the better part of 20 years. I can occasionally give him a hard time if I think he is being silly or making poor decisions. I would not however do that with someone I have only known for a small amount of time or just met the other day.I believe a similar approach would be appropriate when working with these saints as well. If you have not been working with them for a fairly long time you may not know them well enough to take that approach, the Saint, a specific being with his or her own personalities and ideas about things, may take the stance that you do not know them well enough to treat them that way. They may in turn not grant your request or even retaliate in unpleasant ways. If on the other hand say a person is born into a catholic family and has had their own patron saint given to them as a child and they have had a relationship with that saint for most all of their life, that person would likely be able to take this approach due to the long standing relationship that already exists. In the end with this type of thing I believe it just comes down to what kind of relationship a person has with the being they are working with. Ultimatly I do not think we can give you a definite answer as to whether or not a whole pantheon would be upset with you or out to get you. For a very clear answer to that I would suggest seeking guidance from a spiritual professional who works within a Hindu tradition. There are members of AIRR who do so and you can look for them at this site (www.readersandrootworkers.org). What you are describing does sound like it is possible that you are somehow over stepping some boundary with these deities. Perhaps the way your were placing the statue or some other manner of handling the particular being was in some way taboo or offensive to him/her. Find someone who works with those beings and knows how to approach them in order to learn the best way of working with these beings. I do know that taking the baby away from St Anthony will prompt him to grant your wish. A Saint is very powerful ( a heck of a lot more powerful than any of us. We are mere mortals). A Saint needs to be respected. It could be that the Saints that you have worked with don't sense this from you. Reprimanding a Saint in the name is Jesus? I believe, is, well, pretty pretentious. I personally would never do this. I am not Jesus and have no right to speak for him. But, that's me. However, as you had stated, this is not a good practice for Christians. I have heard of workers who do place statues upside down. That is more common. Withholding offerings? We usually don't give offerings until our petition is granted (usually, not al the time). And the offering is the promise we make if the petition is granted. So, this is THE most common practice. Find someone who works with those beings and knows how to approach them in order to learn the best way of working with these beings. Im not sure if this is the right place to ask, sorry if it isn't. I just wanted to know which day to ask for help from St. Cecilia. I know St. Expedite has a day, but I don't know about other Saints. Thank you! Her feast day is Nov 22. The patron Saint of Music. Unfortunately, you'll have to google this yourself (although I did). I didn't have luck either. I will utilize Sunday as well then. Thank you for your help! I have a question, hopefully nobody finds it bizzare:) I recently had a miscarriage at 2 months. As the mother to it, I felt and still feel very connected to it. Has anyone ever thought of or called upon and worked with the spirit of their unborn child they have lost? What are your thoughts on this? Thank you everyone for your input:) Blessed be. I don't think that's bizarre at all, I completely understand where you're coming from. And I'm very sorry for your loss. I don't have personal experience with miscarriage, but I bet you could create a simple altar upon which you light a white candle dressed with Blessing oil and pray for your little one. You could also call upon the Virgin Mary to protect the spirit of the child and to bless you as you heal and recover. Thank you for your response and advice. I will find much comfort in doing this. While I have worked with St. Jude in the past, the work has been quite informal, with only the occasional prayer offered, followed by my request for assistance. What I desire now, however, is a far deeper relationship with him, one in which regular offerings and prayer is given, as I build a much deeper bond with him than what I have now. I wish to begin a deep working relationship with St. Jude, and to see if in fact, the desire to begin such a relationship is reciprocated by him. I'm wondering if there is a traditional way within hoodoo of approaching a saint in ritual, and making my wishes known to them. I wasn't sure how best to approach this, or if there is even a traditional way in which to make such intentions known. It occurred to me that it might simply be a matter of setting up an altar, and starting in with regular offerings. Afterall, if I start attempting to create such a bond with a spirit, without taking that spirit's desires into account, it seems fairly disrespectful, and my magick would not be nearly as effective as it would Be were I to enter such a relationship with a saint that's far more interested in me! Thanks so much for any assistance folks can give me! Hoodoo is not notably a Catholic form of folk magic. That is, while African American Catholic root workers certainly do exist and have been teaching students and being interviewed by folklorists for decades, the practice of Catholic folk magic is found equally among Hispanic, European, and Pacific Island people. I suggest that the most you will learn from studying hoodoo with respect to Saint Jude is the same type of information that you would find in any Catholic forum --"he is the patron of lost causes," "his colour is green," and "his Feast Day is October 28th." What you are proposing seems to be a special mystical connection to this saint which is neither a casual Catholic veneration, nor Catholic folk magic, nor African American hoodoo. I suggest that you ask other Catholic mystics how they might accomplish what you seek to do. I have non human and human spirits that sometimes come to me (I feel them, but is unable to decode the message). I often go to a medium who translates, however I want to be able to communicate with them on my own. What products can I use for this? I dont care to ask them for anything right now just want to chat with them and be able to decode their responses. I use them all the time. GREAT stuff! Hello, folks i need some help with altar construction. I want to pray Maria Dolorosa for healing soul wounds but i dunno what color of altar cloth I need. All other items which I needed i found in your shop. It's great I think about whte and blue altar cloth. But possibly I mistaken. How does one service a spirit? More specifically how do you contact a spirit to make a "pact" with it? Also, are there any spirits/deities/demons who cater to homosexuality? This book ought to help you. I can't answer your question if any particular entity caters to Homosexuality (as I just don't know) but I can honestly tell you that I don't know of any entity that would not help you. But Spirits of humans is a different story. I'm not sure where to post this. I was working a honey jar, and today I have had a conversation with the Spirit helping me. He told me to light a road opener candle. I have had such an experience before when praying to Saint Martha. It's like a conversation I have in my head. My question is can this happen? I mean no disrespect to the Spirit, but this is the first time I have felt such connections. So I find it quite new.. I'm sorry for posting in the wrong place. So sorry! And thank you for the reply. * If you do not recognize the spirit (for instance if you have no vision of it, only a voice or a feeling) and it does not say who it is, do ask the spirit its name. * If the name it gives is not familiar, ask it if it comes from God, or if it is an ancestor, or if it acknowledges Jesus -- in some way, learn both its name and its intentions. * If a spirit tells you to think, feel, or do anything harmful, dangerous, or frightening, send the spirit away by dismissing it from your presence; you may call on the name of Jesus to do this. There are many positive and extremely beneficial spirits who help us in our lives -- but when you asked that extremely basic question, i felt that you are newly exploring the realm of Spiritualist mediumship and should get a heads up on how to handle difficulties. Have i ever contacted negative spirits? Yes i have. Not many, but they are out there. The Association of Independent Readers and Rootworks (AIRR) has prepared hundreds of free instructional pages to help you as you learn to connect with spirits. Each of the following hub pages connects to dozens of other detail pages, and if you read them all, you will have received a great basic foundation in this amazing form of work. Yes, I realise my question was pretty basic. I've worked with candles before, but I have never had such experiences. And although I read a lot of what people wrote on this forum, I never realised I could communicate in such ways with the Spirit. Thank you for sharing those pointers with me, I will certainly keep them in mind. Best of wishes to you as you open the way to spirit mediumship. I need some advice basically my friend summoned some female goddess as you call it a deitie by mistake theirs no name for her he does not know any information about her he is also scared and confused but she has a kind of crush on him and she calls him her husband is that a bad thing? Every-time he mentions he is leaving the house for good she gets very very upset would she hurt my friend ? he is thinking of giving her a food and drink offering such as rum chicken dishes Indian curry meals to please her could he build up solid relationship with her. When she comes through we both can feel her very strong presence in his room i get very dizzy that i want to collapse i blacked out a few times doe.. on the floor but strange thing is the dizziness and collapsing does not effect him for some reason can someone explain why is this ?? P.S if she has love for him could she help him with his love life like make other women love him where ever he goes theirs no information about her such as name he just summoned something he read from a book out came a female goddess bam! From reading your post, I get conflicting goals about what you and your friend want to do about this situation. You say you're scared of this entity, yet you want to leave her offerings, which would strengthen her. Yet another reason why I think you need to speak to a reader and get some no-nonsense advice as well as find out what/who you're dealing with. How important is concentrated prayer, or, to put it another way, is heartfelt conversation with saints as effective as dedicated invocation? Lately I have been having a difficult time focusing my attention on things that don't involve physical activity (side effect of depression, I'm working on it) so the easiest, most genuine way for me to appeal to a saint is to talk to them like I would my therapist and sometimes that involves engaging in something artistic while I'm talking (like drawing or coloring). I'm trying to re-establish relationships with St. Joseph and St. Martha, I have candles, oil and prayer cards for each but that's all. For the past week I have been talking to them daily, but the timing is inconsistent, it's whenever I feel the time is right so of course that varies. Also, I don't have a special place devoted to "prayer" because I live in a tiny studio so right now I have their candles on my desk. I used to keep candles on the windowsill but I stopped when I got room darkening curtains that covered them up at night. Is it okay to have casual chats or will they take offense to this? Also, is okay to talk to both at the same time? So far I haven't been, but I never know what direction my thoughts are going to go in so sometimes there is topical crossover. There are specific goals I'd like to meet with St. Joseph's help while St. Martha is a saint I've always had a strong affinity for and would like to reconnect with. AS long as you talk to them from your heart, it's all that matters. Just continue doing what you're doing and be humble. Also, I would talk to them one at a time. I just want to say thank you to all of the Lucky Mojo gang for being so awesome and sharing so much information. I enjoy listening to you all on my phone weekly. Speaking of which I was listening to a podcast featuring Madame Pamita about Black Hawk and working with him. I am still a bit confused about where to start... maybe confused isn't the right word. I think a better word might be intimidated. I did as she suggested and ask politely if he was willing to work with me. I received several signs in the form of hawks, one was in a kids movie and the other was from a "spirit animal" quiz on Facebook, etc. My question is how do I go forward? Since he has so kindly responded do I need to make a Black Hawk bucket? Also, Kali Mata seems to be calling me. I am not sure how to respond. When I say She is calling me, I mean she spoke to me. I was meditating on who my spirit guides are and the name Kali Mata came through. I was in disbelief because She is a Goddess. I don't mean any disrespect to her but I am an African American woman with no Hindu ties (as far as I know). Are there any suggestions regarding how I should proceed here. I also had a visual of two people who might be ancestors but I am not sure. They appeared when I was meditating years ago and they have reappeared now that I have gotten back into spirituality, Hoodoo, magick, and similar topics. One was an African woman with what looks like white paint or clay on her face and she is wearing white and she seems pretty friendly and generally happy; and the other is a Native American man wearing a headdress and what looks like a breast plate made of bones and beads. He always seems to be standing with his arms folded with a set expression on his face. He doesn't seem angry but he does not seem happy either. I call her the Queen and him the Chief. The odd thing about her is she always seems to go from a crouched position to a standing position multiple times or at least she did when I first met her. I'm a newbie here so any advice would be appreciated. I am so sorry but I am not familiar with this radio show. Your best bet would be a consultation with Madame Pamita. She's a VERY nice lady and you would love her! I have been praying to Saint Joseph using vigil candles from lucky mojo to obtain a promotion at work. My petition regarded achieving the higher position. Pound cake is more traditionally an offering for St. Expedite, not St. Joseph, but if you've already promised him pound cake, don't go back on that promise. Just be aware for next time. I would say to just wait until you get the job to give him the offerings. Well the thing is, when I was going to the site I read my Saint Joseph prayers from, a popup came up every time for sponsoring children in Africa, which I took as a sign from Saint Joseph that if I get the promotion I should give back some of my funds to those who need it most - which would make sense if he doesn't usually want cake! Would you say that is a fair assumption? Perhaps I should give him the promised offerings as well as sponsor a child ? That could just be a website pop up that everybody gets who visits that site. I'm a little suspicious of that one. Hello: I may have mentioned that I am burning candles on a honey jar for Reconciliation. I feel good about this work so far. My question had to do with the candle. I was burning today's candle (I am temporarily working it every day, and will resume M, W, F next week). I was in the same room, fooling around on the computer, when I heard some sharp "pops" and crackling from the candle. Nothing seems to be wrong with it: it is burning clean, with a nice, high flame, and not super fast. I looked up the candle divination page, and it said something about a "noisy" candle meaning something is trying to get through, perhaps a spirit, and to "pay attention." Problem is, I don't really know how to do that. A few weeks ago, I pulled out a cross candle I happened to have and started talking to my deceased grandma. In some ways, she's not the greatest on Reconciliation, but she absolutely loved me, so at least I know she would want to help. I also have a Guardian Angel candle which I'm burning for general spiritual guidance and help, and I ordered some spiritual baths (13 herb) and St. Dymphna supplies from Lucky Mojo to work on myself and my bipolar and anxiety disorders. How precisely can I "pay attention?" What am I supposed to be paying attention to? Usually, I will try to stare at the candle when it's behaving this way, then ask out loud to communicate the message in another manner. What will happen to me is that I will get a thought. The very first thought is what they are saying. Or a feeling (of good if the answer is "yes" or of uneasiness if the answer is "no"). If I still don't get a message right then and there, I will say that I didn't understand. What will usually happen is you will get some sort of sign after that. Now, if I get an "uneasy" feeling, I immediately check the candle because sometimes they will forewarn me that the candle needs "doctoring". Or something might be off with the candle. If it's a positive feeling, I will thank them out loud. it takes a little practice but once you get it, then you'll understand! Just as a human who loves the saints, I would say yes. Just to clarify, you asked for something and he gave you a better job in slightly different circumstances? Just for me, I’d thank him and then ask him for insights, maybe using Clarity oil. Maybe your team is about to get itself into trouble. You don’t know that, but St. Joseph is way ahead of you and looking out for you. Anyway, just a thought until the real people who know what they’re doing weigh in. I am lost in life right now, I don’t know if I should drop out of college or not. The thing is, it’s destroying my overall health but also my parents paid a lot of money for me to study. Maybe you could recommend me a saint that could help me make this decision? That would mean a lot to me. So I decided to drop out of the University that I’m in now and apply to a university in London. The problem is, I’m not sure my parents will be fine with this, because London is far away from my country and I’m sure they’ll be worried about the money (which I’ll get covered somehow). So what I need is a Saint that could help me convince my parents that everything will be fine and that they have nothing to worry about.. Maybe I should petition Saint Thomas Aquinas? As he is the patron saint of students. Or Saint Martha, as she dominates people? I think you answered your own question . I believe St. Aquinas would be a great person to start developing a relationship with now, if you two get a long well I'm sure he'd help you in your studies as well! As for St. Martha, I wouldn't want to dominate them If I were you, seems a bit heavy handed and counter-intuitive for just getting them to understand you'll be safe. You want to comfort them and ease their minds, not beat them into submission and let you go. If you already work with Mother Mary, or St. Joseph, being the parents of Christ who gave the ultimate sacrifice I believe they are the patrons of their roles, mothers and fathers and help those understand what is best and for the highest good for those involved. Good luck on your new academic journey! I have been harassed and assaulted by my spirit guides and want to get rid of them as they are disagreeable (and trash in my eyes) and wouldn't leave, plus everyday is a fight. What should be done to get rid of them PERIOD and to block any spirit from connecting to me ever again.